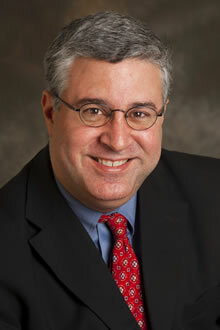 Fadlo Khuri co-directs Winship Cancer Institute's research program in developmental therapeutics. Fadlo Khuri, deputy director, describes what sets Emory's lung cancer program apart from others in Georgia. While the success of Winship Cancer Institute is apparent, what may be less so, says Winship Executive Director Walter Curran, are the many roles oncologist Fadlo Khuri has played in helping Winship achieve this success. "Over the past decade, Fadlo has been the one constant, the one steady voice, the cornerstone of a Winship that he knew was possible and was determined to help build. We would not be where we are today if it had not been for Fadlo." Khuri's changing positions at Emory illustrate how he has helped Winship evolve in its move toward National Cancer Institute (NCI) designation. Recruited from MD Anderson in 2002, Khuri served as Winship's chief medical officer until 2007. That same year he was named Roberto C. Goizueta Distinguished Chair in Cancer Research. He currently co-directs Winship's research program in developmental therapeutics with Haian Fu, whom Khuri calls Winship's "most valuable franchise player." Winship's final push toward NCI-designation created more roles for Khuri. First, the hematology and medical oncology group was elevated from a division in the Department of Medicine to a full-fledged department in the medical school. This shift was important in making Winship an umbrella or "matrix" organization integrating all cancer service lines, including radiation oncology, surgical oncology, diagnostic imaging, hematology and medical oncology, and pathology. Khuri, then division director, became chair of the new department. Second, in response to suggestions from NCI, Winship reduced its number of deputy directors. From 2009 on, as Curran moved into the director role, there would be only one deputy director and that would be Khuri. The new role allowed Khuri to step back and look at the broader picture, providing Curran and others with constant evaluation and feedback about Winship's quality of patient care, clinical research, and compliance with NCI guidelines. Big picture, yes, but Khuri's feet are very much on the ground. In addition to his administrative and research responsibilities, Khuri spends Wednesdays seeing his established as well as new patients, most of whom have been diagnosed with lung or head and neck cancer. Over the past ten years, Khuri has been involved in recruiting more than 60 clinicians and researchers to Winship, an expansion critical for obtaining NCI status. He's proud of those recruits and even prouder of having helped so many faculty, both new and existing, embrace the dual citizenship in a departmental home and in Winship. "It's become an easier sell," says Khuri, who is also a dual U.S. and Lebanese citizen. "Not only are cancer care and research becoming a team sport nationwide, but Emory and Winship leaders are working hard to create value in Winship membership, building a common culture in which accomplishments of the group are celebrated as much as accomplishments of individuals."